Richmond has needed an upscale Mexican restaurant for ages now. We have more than our fair share of the obligatory restaurants where they serve your standard tacos, enchiladas, and burritos, but not one of them steps out of the box to make it fresh, exciting, and authentic. Lovers of Plaza Azteca will disagree with me, but the few times I've been there, I haven't been overly impressed. Several years ago at one of our outdoor malls we had Uncle Julio's Rio Grande Café. It may have been a chain, but it didn't feel like a chain. The food was so outrageously fresh and delicious, and the flavors so amazing that I literally cried when they closed their doors. So when I heard that a new, upscale, authentic Mexican restaurant was opening up downtown, I was really excited. It had been a long time coming for RVA. My first trip to Casa Del Barco was with a friend on a rainy Tuesday evening. The second time was on a pleasant Friday evening with my husband. Both experiences, beside the quality of the food, were different, so I'm going to try and break it down the best I can in a (mostly) logical fashion. Location: I already knew that there were challenges with the restaurant's location: situated downtown on the Canal, the turnoff for parking is sharp, and although there is now a large sign on the building up above the turn, we still missed it thanks to the driving rain. There's also an issue with parking: You can either park in the Troutman Sanders parking deck, which validates for free but puts you on the other side of Canal (there is a bridge that connects the two), or you can use the valet service, which is $6 (plus tip). Both times we opted for the valet service, especially since the first time I had no idea where the Troutman Sanders building was (I admittedly have a negative sense of direction), and the second time we didn't want to bother with the hassle. There are no other parking options close by that we could see. Service: I had reservations for both nights, and both nights we were promptly seated. Tuesday night with my friend found the restaurant with many empty tables, and an equally empty bar; yet 15 minutes went by and we still hadn't been asked for our drink order or been offered water even though tables who had come in after us were already being served appetizers. Eventually we waved down the hostess and immediately a waitress showed up apologizing profusely, giving us the explanation of shift changes. Or something. At this point we were both starving, and we put in drink orders (both non-alcoholic) and our food order. The manager also came over and apologized to us, and also took off our drinks and dessert from our bill. On Friday night, we waited about 5 minutes before a waiter came by to take our drink order, but the place was packed and the bar was about 4 deep thanks to Happy Hour. This waiter was also very apologetic, and service was smooth both times from there on out. I was impressed that all our waiters were very knowledgable about the menu, and all the different flavors. 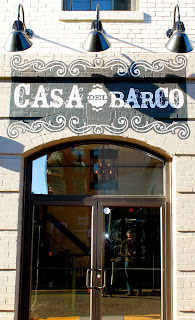 Décor: The space for Casa Del Barco is very cool. Situated in an old warehouse, the interior is warm and inviting, but also a little whimsical. The back wall has large windows overlooking a patio and the Canal, and in between each window are rustic wooden pallets overflowing with succulents. The bar is very hip looking, and over the middle of the space, tequila bottles have been installed to serve as lights. A screen print of the chef's Mexican family graces the near wall. Another neat touch was that our tap water was served icy cold in an old tequila bottle, which I thought was kind of genius. Food: Casa Del Barco has become known for their tasty non-traditional guacamole (bacon and tomato, crab, and mango-habenero are a few of the neat-looking guacs). I didn't partake in this because I can't stand avocados, but I hear that if you are a guac lover, you won't be disappointed. The first night I was there both my friend and I skipped drinks, but the second night I had the Blackberry Basil Margarita on the rocks, and it was beyond excellent. However, it came in a small glass and cost $11. Both my husband and I were a little shocked at the price - this isn't New York City, which is the last time I paid that much for a drink (actually a drink that size in NYC cost me $13). There are many beer options, and an extensive tequila list as well but you're out of luck if you just want a glass of wine, because you can only get it by the bottle. Surprising, since Mexico has been coming out with some really great wine offerings over the last few years, as well as the whole of South America. Tequila Flights seemed to be pretty popular as well, and from what I could tell came with their own limes, salt, and some sort of hot sauce chaser. On Tuesday my friend ordered the Ceviche with shrimp and calamari over mixed greens, and the Smoked Mushroom Tacos which came in their own stands with a few toppings like pickled onions and peppers and marinated tomatoes. She loved the Ceviche, and liked the flavor of the mushrooms in her tacos very much. I had the Ancho Braised Pork Shank, and I had some problems with it. First of all, pork shank is a very tough cut of meat to maneuver easily. It basically encloses a bone, and while one side was perfectly crispy with bold flavor, the rest of the location of the meat was a mystery. I basically had to hack away at it to find the meat, and while it was tender, the flavor by that time had been lost. I also had to ask for a knife with it, which seemed a little bizarre to have to request for such a cut of meat. It came with grilled pineapple and a Poblano Hominy Cake, which I loved. Crunchy on the outside, and creamy on the inside, the cake was perfect and delicious. I ordered the Traditional Flan with Guava Syrup for dessert, and that was exceptional. It was hands down the best flan I've ever had in my life, thanks to its perfect marriage of flavor (guava, cinnamon) and texture. Friday night my husband and I shared the Slow Roasted Pork Empanadas, which were fantastic. The pastry was tender with just a little flakiness, and the filling was savory, which paired perfectly with the pineapple salsa on top, bursting with fresh citrus flavors. My husband had the Tamales for his main course, which he absolutely loved. I also really liked them, which is saying something because I don't care for tamales at all. His black beans were perfectly seasoned, and while his spanish rice looked ordinary, the flavor was delicate and fresh. I went with the Chipotle Braised Beef Short Ribs, and while I was more pleased with the flavor (and also that they gave me a knife with it) I was very disappointed that there was so very much fat on top of the ribs. I know that fat equals flavor, but after I scraped it off to get to the meat underneath, I was left with a heap of disgusting looking blobs of fat on my plate. I've never been served braised ribs like that before, and I don't really understand why the fat couldn't be removed prior to serving. For dessert we shared Mexican Bread Pudding, which was very good, but my one complaint was that the caramel sauce (they said it was caramel, I think it was more like a toffee sauce), while delicious, hardened right away on the plate, and made it very difficult to scoop and eat with the bread pudding. Overall: Casa Del Barco will be a big hit with the warmer weather thanks to its large outdoor patio overlooking the Canal. If Happy Hour was any indication, young professionals of Richmond have already decided Casa Del Barco is the place to be for drinks after work, though how any of them can afford the mixed drinks at those prices for what amounted to two hours is beyond me. The thing that is going to kill Casa Del Barco is their prices, especially on drinks, and also on their food. I was flabbergasted to see that their "famous" crab cake was $29. It's not like we're land-locked with the Chesapeake Bay and Atlantic Ocean just 2 hours away. They've got to bring the prices down or the novelty of the authenticity that they're selling will quickly fade away and diners will search for something with maybe less quality, but better prices. My takeaway is this: Casa Del Barco absolutely offers a departure from standard Mexican restaurant fare and presents bold, authentic, and unique flavors. Those who love tequila will especially be rewarded by dining at Casa Del Barco. In my estimation they make some serious missteps, but nothing that can't be fixed with time and refining. If they bring their prices down, I think they'll have a winner on their hands that might just endure. Snow Day Treat Take Two: Snow Cream!